Just checked the weather report and today is supposed to climb to 85, with 73% humidity. For our Pacific Northwest town, that’s hot! When I think about heat and humidity, I remember summers in Bucerías, three-shower days, and Nicolás out in the garden pruning hibiscus with his tiny shears, snip, snip, snipping. I see his beautiful brown hands flowing from branch to branch, as if he were playing a musical instrument. Nicolás was the eighty-year-old gardener at Bungalows Arroyo, where we lived on the west coast of Mexico. He wore a wide-brimmed straw hat, and an immaculate white shirt and white pants, which his wife washed and hung out to dry each evening when he returned home, after twelve hours in the sweltering sun. Nicolás worked five and a half days each week, including a half-day on Saturday, for a total of 66 hours, to make the grounds of the apartment complex look perfect. He’d worked at Bungalows Arroyo for years, even though he was paid very little for his effort. He was especially knowledgeable of all things connected to hibiscus, and smiling. His grin spread even wider across his face and he threw in two twinkling eyes. “I love what I’m doing, Susana. I love making this garden look like a painting.” Nicolás was an artist and his shears were his paintbrush. I had just returned from a run on the beach and was greeting Nicolás when I heard Harold’s loud voice. It made me nauseous. “Did he just call me boy?” Nicolás asked me in Spanish. He did not speak English and Harold apparently knew only one word in Spanish. I looked at Nicolás. I hugged him, and called Harold something I can’t write here. I walked up to Harold and Evelyn and said, “You can’t do that. You can’t call Nicolás niño. He’s a man, your elder, and my friend. And here are two new words for you in Spanish: Por favor, which together mean ‘please’.” I helped the couple carry their possessions into the apartment while Nicolás continued working on the palm fronds. A few weeks later when I asked Nicolás, he told me that Harold never treated him disrespectfully again, but I think that was mostly because Harold avoided him. Harold certainly avoided me. Another day during the rainy season, Nicolás taught me how to cut off hibiscus branches and stick them straight into the ground. “Nothing more is needed for these to grow into new bushes,“ he assured me, and within a week or so, they did. This technique, by the way, also works here in the Pacific Northwest with wisteria and even blueberries, but only during our rainy season (most of the year). 1-2 cups dried hibiscus flowers (called flor de Jamaica, it can be purchased in most local Mexican stores and some supermarkets in the U.S.). 12 cups water + more if desired. Sugar to taste, or another sweetener. I use agave syrup, or piloncillo, a cane sugar product, also found in Mexican stores. 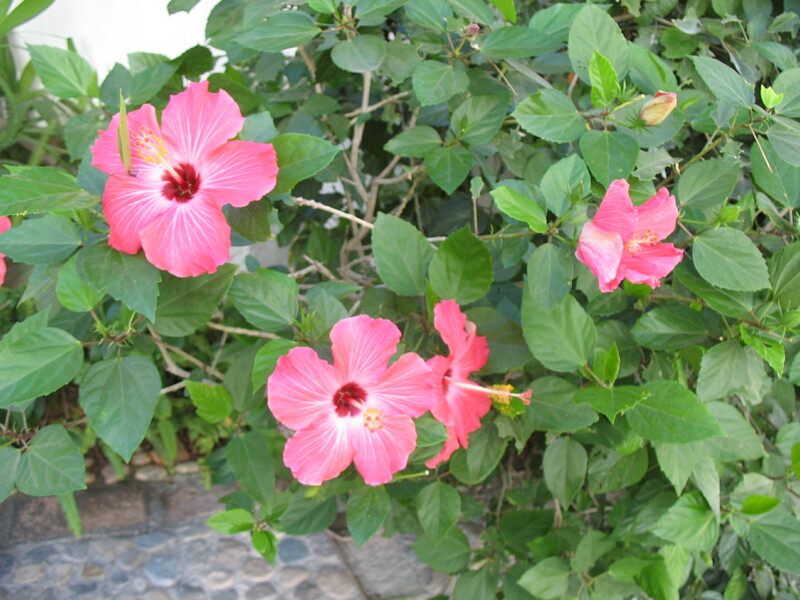 Put the hibiscus flowers in a colander or sieve and rinse under cold tap water. Bring the 12 cups of water to a boil in a large pot with a lid. 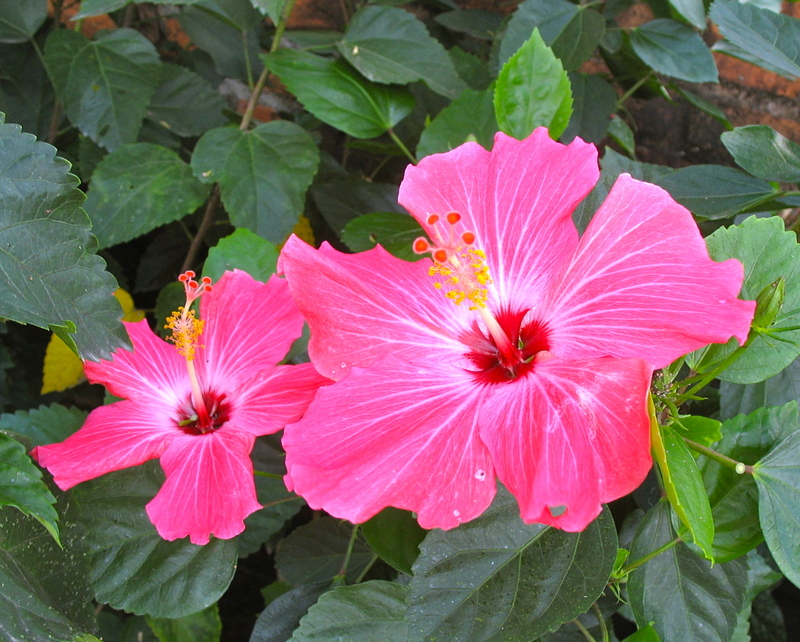 Add the hibiscus flowers to the boiling water and bring to a boil again. Cover, lower the heat and simmer for 20-25 minutes. Strain through a sieve into a large pitcher. Add sweetener to taste, and more water if you want to make a weaker tea. Pour into ice-filled glasses. Serve. Some people like to garnish their agua with lime or orange, or a sprig of mint. Others mix the agua with sparkling water or splash in some rum, but for Nicolás a hint of sugar was enough. Yola, another Mexican friend who was on a perpetual diet, did not add sugar to save calories. For me, that’s too tart…like cranberry juice. 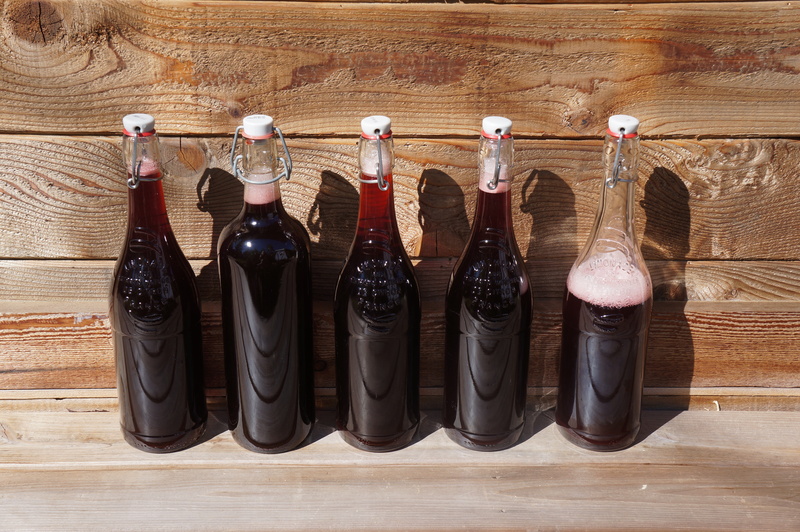 Here are two videos of slightly different versions of agua de Jamaica. The first, is in English and uses brown sugar to mimic piloncillo, for sweetener. The second, my favorite, is in Spanish, but easy to follow and features the delightful Angela Tejada. 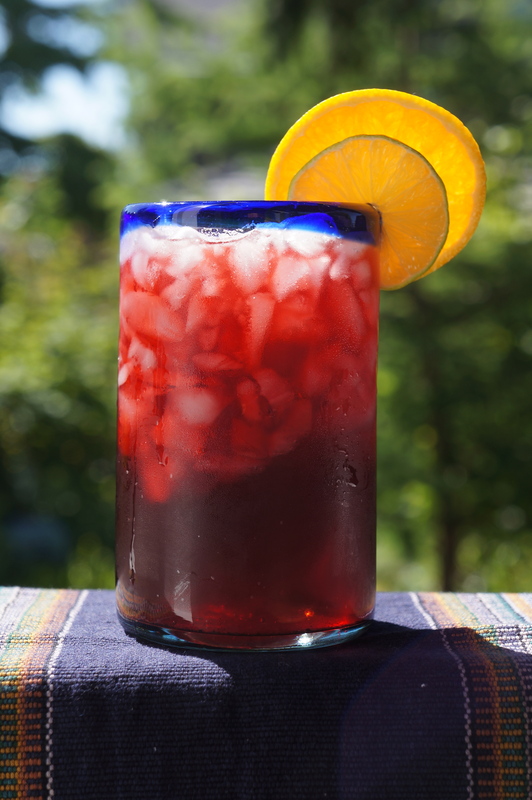 If you make agua de Jamaica, and I hope you will, you’ll probably find that it’s a bit of a diuretic, another quality Yola loved. There’s also some evidence that drinking the tea over time may lower blood pressure. And there’s even more good news about this heavenly plant. One summer, when we were about to return to the Pacific Northwest for a month, a new family moved into one of the apartments across the way. Their teenage son, Michael, had been battling leukemia for some time and had just undergone both chemo- and radiation therapy. His legs looked thin as hibiscus branches poking up out of the ground and were nearly as pink as the flowers, but Michael’s mouth was the big problem, his mom told us. It was full of sores, a complication of his treatment. He was having trouble swallowing, due to the pain in his mouth and throat and was losing weight rapidly. I told Nicolás about this, and he suggested giving Michael a batch of agua de Jamaica, which I did. The next day Michael and his mom knocked at my door. She handed me a loaf of banana bread. Her eyes were red, but she was smiling. “Michael, why don’t you tell Susan what happened,” she suggested to her son. I can vouch for how deliciosa es agua de Jamaica. Beautiful story. Makes me wish I were south of the border. Yep, south of “la frontera” is very nice, but not so much in the summer unless one continually drinks el agua. Gracias, Kari. My body temperature is declining just reading about it. Ja ja! So happy to have cooled you off. it was a hot one today, eh? My body temp is cooling just reading about it. Thanks, Dawn. Your blend of tea and lemonade sounds yummy and I’ll have to try it. 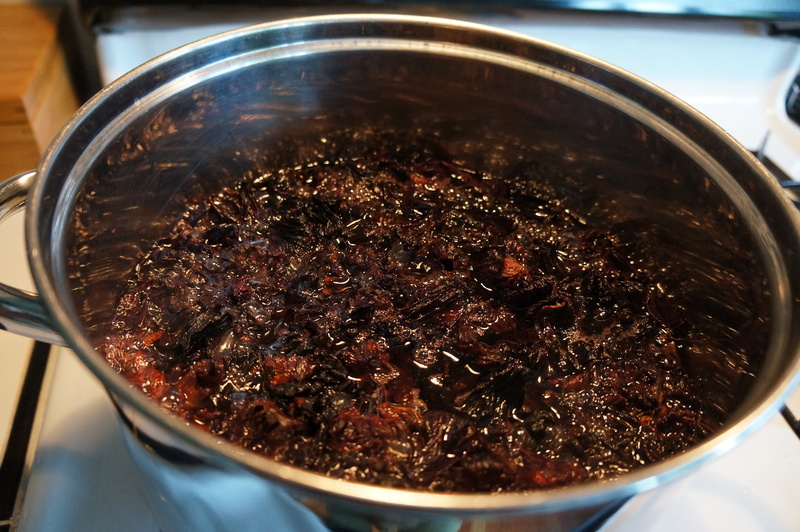 I think the big difference might be that when you boil the hibiscus flowers the flavor is incredibly rich. They are actually the calyces (from calyx) of the flower and a long boil will produce an amazing flavor. At any rate. this is how Nicolás made his. As for what has become of him, I will find out next February when we return to Mexico for a couple of weeks, and let you know. Compelling tapestry of tales—more than mere tales—snippets from the heart—the soul and loins of humanity….wrapped in a flower, for sure—fires up the embers of time and space—reminds me that melancholy has a home in the fields, where happiness grows–fitfully, but no less fertile. I feel what you’ve committed to this page are moments of grace—coded instructions for a life well-lived. With an open mind, and alimentary canal, I eagerly listen to the sound of your music. A quadrillion seconds holding my breath. Your comments are like watching a silver rain from under a crystal umbrella, and suddenly the sun explodes out. You’ve created.a new genre of beautiful writing: Creative Commentary. Like receiving feedback in a technicolor dream. I am so lucky, J. Thank you. Sentience in a see-through jar–an unopened container loosed to the larger world—my inspiration comes from your perspiration. Well, dang, dawg! Tee hee to infinity. I am so glad you spoke out for Nicholas! Thank you, Naomi. I wish you could have met him. Hibiscus Tea…..aaaaah, nectar of the Gods!! ← What about the wind?